Breathtaking Unobstructed Skyline Views are Everywhere in this Amazing Home! Enjoy Large Open Concept Living & Entertaining! Sweeping Livingroom with Fireplace and an Oversized Wall of Windows with Glass Sliders out to your own Private Deck and Private Landscaped & Fenced in Yard! 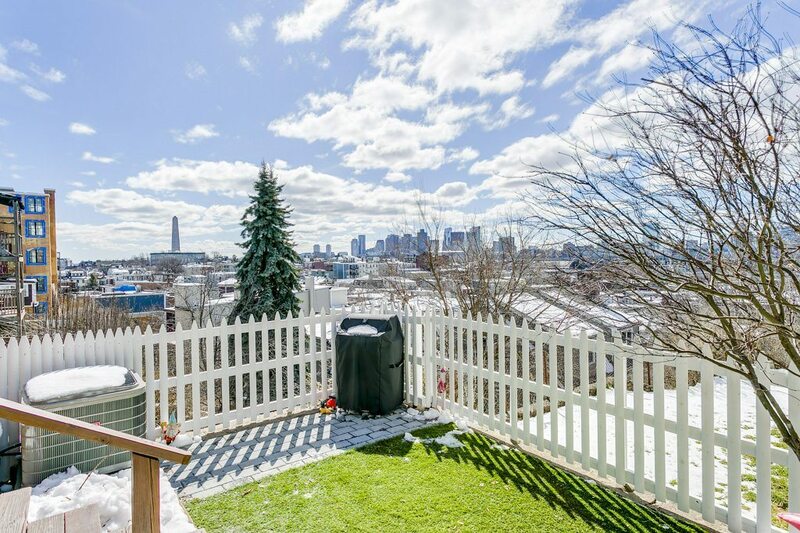 They both offer the most compelling views of Boston, the Back Bay & the Bunker Hill Monument! Designer Chef’s Working Kitchen boasts abundant cabinetry and wonderful granite counters with a peninsula and island! Exposed Brick Walls are tastefully accented throughout the Entire home! Gleaming Hardwood Floors throughout! Generous MBR with custom en suite bath! Very generous second bedroom and large guest bathroom. Laundry in unit, Central Air & Storage room! Programmable NEST Thermostat!Don’t Miss out on this One of a Kind Home! Easy Access to all that Charlestown has to offer! Direct bus lines to the Financial District & Sullivan Square T stop, minutes to highways! Outstanding Value!